FIRST FRENZY: Raising the Bar is played on a 48’ by 24’ carpeted playing field. The game is played by two alliances each consisting of two robots. The field contains a large centre structure which consists of two lower decks, measuring 8’ by 8’ by 6”, with an upper deck in between the two lower decks, measuring 4’ by 8’ by 6”. Each lower deck contains a 28” diameter stationary goal made out of 2” PVC posts. A steel pipe pull-up bar is based on the upper deck; its height is 10 feet from the ground. There are two 28” mobile goals, also made from PVC posts, which are mounted on casters and start next to the upper deck. Above both driver stations are ball delivery systems that store 18 small balls which are released if a bonus ball is removed during autonomous mode, otherwise not until 45 seconds into the match. The scoring objects are small 13” diameter scoring balls and large 34” diameter doubler balls. Alliances attempt to gather small balls and transport them back to their human players using the ball chutes at the end of the field. Human players try to score the small balls into either their alliance’s stationary or mobile goal, worth 5 points. 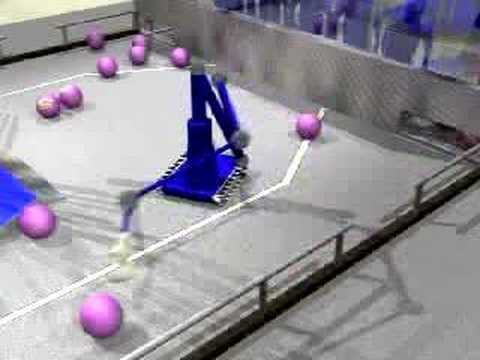 Robots can use the large doubler balls to cap a goal in order to double the point value within the goal. At the end of the match robots can earn an additional 50 points by hanging from the pull-up bar. Each module steered independently by a Globe motor. With the taste of success still lingering from the rookie season, Rourke and Phillips built on the successful foundation. Organizational development discussions were held to align the team mission, culture, and core values. Organizational strategy set the stage for improved team structure. Student team leaders and sub-team leaders were established to run the team business. The mentor base was strengthened. Rourke recruited former Woburn Team #188 FIRST Robotics veterans Ian MacKenzie and Karthik Kanagasabapathy (both of whom were attending The University of Waterloo) to provide seasoned mentor experience and to pass along lessons learned from past competitions. SimSwerve (a strafing, omni-directional mobility system) was born from the creative juices of the design team. Strategy development and analysis drove Simbot "Simon" to new heights of success in the 2004 FRC Game, "FIRST Frenzy - Raising the Bar". A gold medal at the Long Island Regional, silver medals in both the Pittsburgh Regional and the Canadian Regional, and another trip the National Championship in Atlanta, Georgia are just a few of the memorable highlights of the successful sophomore season - with "GM Simbotics" winning more awards than any other FIRST Team in the nation. Chairman's Presenters: Emerald C., Sean M.